Welcome to the website for Forrest Junior Badminton Club. Like our parent club, we have achieved Premier Club Mark Accreditation with Badminton England. We provide two junior coaching sessions per week and have two teams entered in the Greater Manchester Junior Badminton League. In addition to providing opportunities for improvement and competitive play, the club organises various social events throughout the year. The Wigan Badminton Bonanza is back for 2014 and will be taking place on Saturday 25th and Sunday 26th October at Leigh Indoor Sports Centre. It features tournaments for all disciplines for both adults and juniors (U16s, U14s, U12s). Early this morning Chris Adcock and Gabby White (currently ranked world #7 and England #1) got through to their first ever Super Series final. If they pull off a win tomorrow then it will be only the second time that England have won a title on the Super Series circuit! To get through to the final they beat world champions, and top seeds, Zhang Nan and Zhao Yunlei in the mixed semi final of the Hong Kong Open. The final will also be live streamed tomorrow on Youtube, but because of the time difference this is likely to be about 5:30am :S If you're like me and don't fancy getting up that early then it should be available to watch on https://www.youtube.com/badmintonworldtv shortly after. UPDATE: They won! An amazing achievement. You can watch the final at https://www.youtube.com/watch?v=2h1qW_abR-I. The Wigan Badminton Bonanza is back for 2013 and will be taking place on Saturday 16th and Sunday 17th November at Leigh Indoor Sports Centre. It features tournaments for all disciplines for both adults and juniors (U16s, U14s, U12s). The Forrest Ceilidh returns once again for 2013. Contact Brenda for tickets or if you have any questions. Brenda will be hosting this year's club BBQ at her house next Sunday 25th August from 1:30pm. Bring your own food and drink. Entertainment and games will be provided. All Forrest members and their families are welcome. From 1st - 6th October 2013, BADMINTON England will host the first ever London Grand Prix tournament at the Copper Box Arena in the Olympic Park. As a Premier Club, BADMINTON England are offering our members free tickets for Tuesday 1st, Wednesday 2nd and Thursday 3rd. If anyone is interested in applying for some free tickets for any of these days please get in touch and let us know ASAP as the deadline to apply for tickets is Thursday 18th July 2013. Forrest Junior Badminton Club are pleased to announce that they will once again be running their junior coaching sessions throughout the summer period. To register for a place, or if you have any questions please contact Ray. 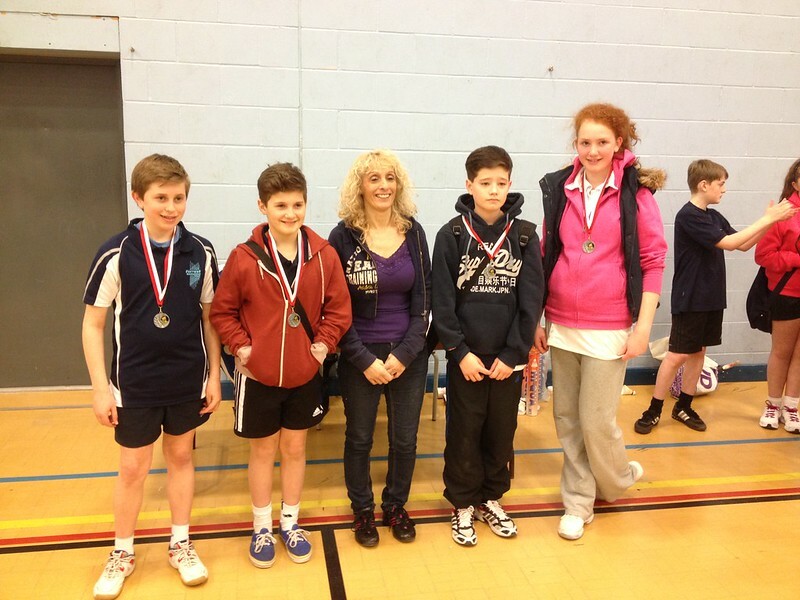 Sunday 24th March saw the finals of the Greater Manchester Junior Badminton League take place at Belle Vue Leisure Centre. Congratulations to our younger team who ended up runners-up in the Younger group competition. Full details on TV coverage is available here. Check out the trailer for the Championships on Youtube. 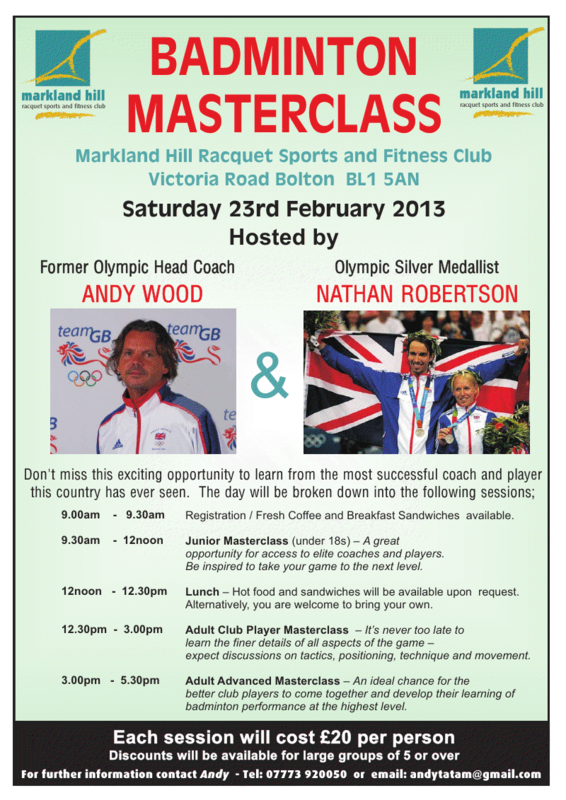 On Saturday 23rd February 2013 Markland Hill will be running a series of Badminton Masterclass sessions hosted by former Olympic head coach Andy Wood and Olympic Silver medallist Nathan Robertson.